As I listened to the debate during the Revenue Estimating Committee I was struck by the unchallenged revisionist history being bantered about. Flash back to the time just after Katrina. In the days immediately post-Katrina the legislature met in special sessions to address what at the time looked like a fatal blow to the state’s fiscal structure. Some drastic measures were prudently taken to avert a crisis but to almost everyone’s surprise the “end of the world” scenario didn’t come about. Instead an interesting phenomenon took hold as rebuilding got underway; the state discovered that the massive influx of Federal and private funds created an equally massive windfall of state revenues. We had experienced a Katrina Effect, so to speak. Our legislators’ reaction was predictable; they spent the windfall billions as if they were drunken sailors. Worse though, they spent a great deal of it on recurring expenses, ignoring the reality that these funds would not last. And true to form the funds did not last. A byproduct of all this sudden wealth was a change to the infamous Stelly Plan. Originally Stelly had reduced recurring sales taxes on certain items by about $800 million, to be offset by increased income taxes. Just after he came to office, at the tail end of the Katrina Effect and before the realization that the windfall was not endless, Governor Jindal went along with a reduction in the Stelly income tax rates. This reduced recurring income by another $800 million. All told between 2002 and 2008 Louisiana had reduced its income by $1.6 billion. But the state was awash in Katrina money. Who cared! By Governor Jindal’s second year in office the party was over. The Katrina money was gone and the two tax reductions really started to bite into revenues. But what hadn’t terminated with the end of the Katrina Effect were the recurring expenses that had been adopted by a legislature that could not resist the allure of spending all that bounty. Though his abandonment of Louisiana for personal aggrandizement has cast a dark cloud over his legacy, Governor Jindal did finally realize the folly that had occurred. As a result he wisely undertook a serious austerity program to wind down the recurring spending for which there was no recurring income match. But this brought pain to a bloated bureaucracy and since it was done without a making a strong case for good spending practices the public lost support for the governor. His later term could have been the ideal time to undertake serious restructuring of state government but Governor Jindal was by then politically crippled. 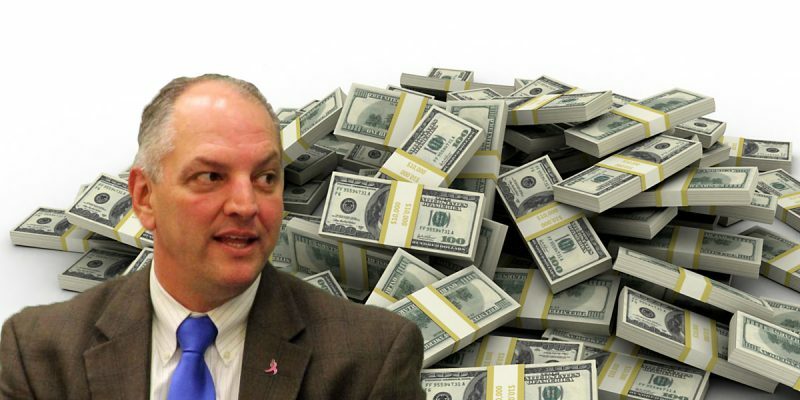 Our current leader, Governor Edwards, had and has no desire to restructure government, rushing instead to a return to the bad old days of incurring massive recurring expenses without any thought to matching recurring revenues. And so in the three short years since Governor Jindal left we have seen state (note: not Federal) spending increase about $6 billion and most of it recurring. State taxpayers are so far on the hook for nearly $6 billion more in taxes and other revenues under Governor Edwards. Imagine what a second Edwards’ term would bring! When Commissioner Dardenne spoke at the Revenue Estimating Committee he followed Governor Edwards’ tactic of selectively citing history. For instance, he failed to mention that Governor Edwards had himself voted for a majority of Governor Jindal’s austerity budgets and in particular for the Stelly income tax reductions. The Commissioner regurgitated the favorite talking point of the Democrats in the legislature, that the Stelly income tax reductions have been solely the cause of all of our current fiscal woes. In fact history tells us that the truth is there was as much or more impact from sales tax reductions and a devastating mis-alignment of recurring spending versus recurring revenues. But with this Administration, hyperbole and selective history are, along with fear, their favorite tactics. All of this leads to our current dilemma. The governor has a debt he must pay to teachers’ unions for their support of his election and he has to do it in such a way that they have a need to help him again. So he has proposed a nominal pay raise that will add about $100 million in recurring annual costs. In order to garner the School Board and Superintendent Associations’ acquiescence he has also proposed increasing the Minimum Foundation Program (MFP), the state fund supplementing local school board budgets, by adding another $48 million or so in recurring expenses. The governor apologetically speaks to this plan as he goes on that he promises he will give teachers more next year, which fits nicely into his strategy of hooking them into supporting his re-election! Taken as a whole it appears that this plan will add about 5.5% of growth to the current MFP, our recurring funds transfer to local school districts. This expense makes up nearly half of the discretionary budget that the legislature can control. Where will this revenue come from? Well simple, with his threats to throw Grandma out of nursing homes and to end LSU football last year he tricked the legislature into voting for too much in the way of new taxes. He believes that that largesse will cover these costs and it probably would. But the problem we face is all the other recurring expenses incurred under his leadership. The most glaring example, though ignored by a willing media, is that his unilateral Medicaid Expansion will add on average $100 million a year compounded to recurring expenses. This alone will add on average $100 million this year, then $200 million a year, then $300 million a year, and on and on, growing as far as can be projected. So where do we get that money from? The sales tax increase that the legislature fell for last year will not cover it – so either much more in taxes plus major cuts must be coming to other areas of government; education, public safety, infrastructure, etc. The answer is that the governor doesn’t care. Our governor has one goal and it does not include good fiscal practice; his sole goal is re-election. As relates to education you will note that in his first term he has done nothing, suggested nothing to enhance Louisiana’s near-last-place standing in educational outcomes. By his inaction it is clear that his professed concern about the kids was all just phony political rhetoric. Spend, spend, and spend some more. The simple truth is that after re-election he is a lame duck and the fiscal crisis resulting from his out of control spending will be someone else’s problem, at some future time. How better than to trick the people by using non-existent future taxpayer money to convince legislators to increase recurring spending in order to buy re-election support and votes!